And now to return to the Dresden Files, partially because I'm going on holiday soon and my husband's threatened to bring the official board game with him, so I wanted to be at least a little further in the series. Also because I like what I've read so far and want to see how the series progresses. Grave Peril follows Dresden as he teams up with one of God's chosen warriors to try and quell a sudden uprising from the spirit world. While ghosts are normally harmless with the occasional poltergeist making a nuisance of itself, Chicago's dead are now anything but quiet and unusually powerful to boot. On top of that, Harry soon finds himself having to contend with tracking down a vulnerable young wizard and a party where he has to play nice with Bianca and the vampires of the Red Court. 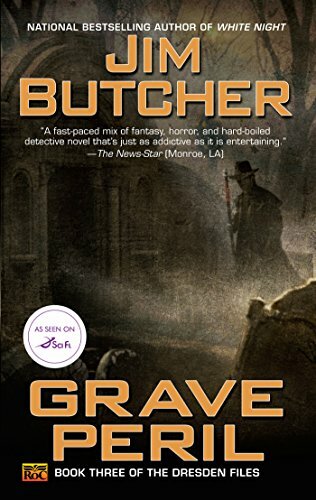 I personally found Grave Peril to be kind of a stumble in the series thus far. While I still enjoyed the overall experience of reading it, after the first two installments this one was kind of disappointing. So, let's start with the positive. I really liked the ghost stuff. The confrontation at the beginning in particular was really harrowing and so well-written. If there had been way more of that, then I think I would have been able to forgive some of the mis-steps a bit more. So, the first thing that bothered was the introduction of Michael. While I don't have a problem with practising Christian characters in the books I read, I kind of found him to be a sanctimonious bore. At first I thought he'd be a fun addition, considering how much he seems to enjoy winding Harry up, but he didn't really go much beyond that. And it's unexpectedly annoying to have a character telling someone off for language that wouldn't even get a PG rating. Second, it either doesn't feature or actively incapacitates my favourite characters, instead choosing to focus large parts of the narrative on Susan. This is more a personal gripe, but it really hinders a story when I don't care if one of the main characters dies or not. Third, there's a big chunk of plot that occurs because of a case that Dresden helps close involving a sorcerer that summons a demon. All of which happened before any of the novel's events and isn't actually shown properly during the entirety of the narrative. Now, it might just be me, but if an event had tantamount importance to why Dresden is having problems now, then I'd be tempted to include it somewhere. Not just a nightmarish "what-if" version where everything goes wrong. Because as it is, it feels like cheating when Butcher reveals "oh yeah, it's part of that case that I keep alluding to, but will never disclose in full". Finally, after the initial encounter with the Red Court at the party, the story starts to drag a bit. It stops being tense and suspenseful, and starts being various repetitions of "Oh no! The last of my reserves! Wait, wait... never mind, found some more. Carry on." It stops being tense once Dresden uses up his last ounce of strength more than once, and starts feeling a bit cheap. I will admit, the wrapping up chapter makes up for it a little by introducing a bigger conflict that I hope to really sink my teeth into.